Update 11/08/2009: Finished model pictures can be found here. 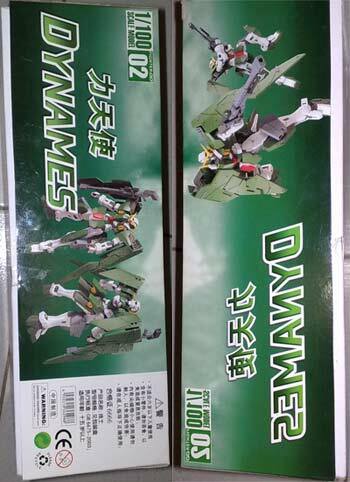 I went back to the mall and bought a bootleg GN-002 Gundam Dynames to review in this site from a stack of bootleg gundams that I had seen. It cost me about 1078 yen. 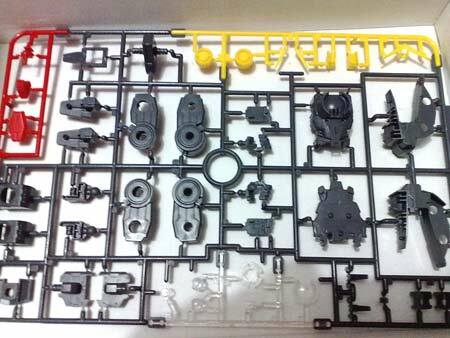 At Hobby Link Japan (HLJ) this was selling for about 2300 yen. I'll probably buy this from HLJ in a couple of months in order to better differentiate the quality of the pirated versus the original. Judging from the box shots you can see that they had copied everything down to a T except for the pilot which was visible in the original Bandai product. Instead of the red Bandai mark, it was replaced with a "TT Hong Li" tag. Also they missed out on the "Gundam" tag. 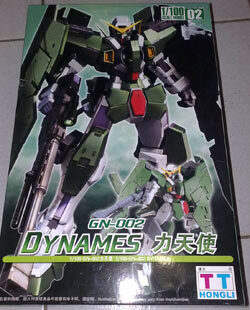 I am shooting at the dark here, but assuming that Bandai has already trademarked the term "Gundam" in China. 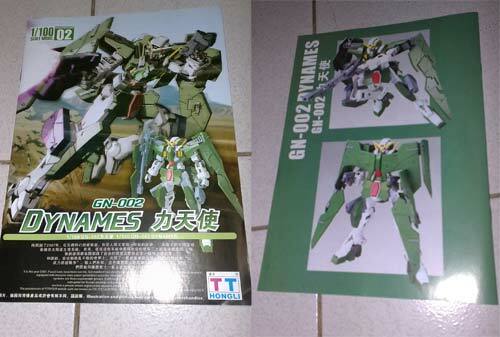 This could be some sort of a defensive tactic by the Chinese bootleggers to circumvent it since when they get caught they could always say that its not a "Gundam". This way Bandai will have to start suing in the individual product level for copyright infringement. Looking at the side view of the box shots, one can even see a "Please Recycle" logo. Considering that China is fast passing the US as the number one emitter of CO2, even bootleggers have started being environmentally conscious. Here's some shots of the manual. 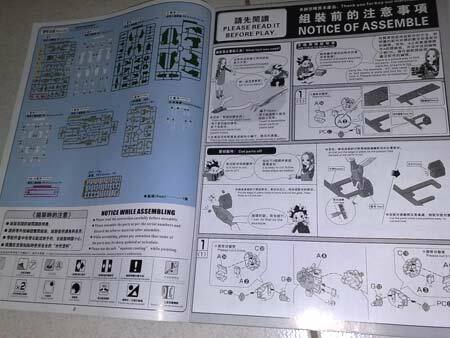 Bootleggers go to greater lengths by translating the manual to english. I'd like to say that the bootleg plates pales in comparisson to an original Bandai Plamo kit, but having compared this to my VF-25G I have to say that the difference in the fineness of the details is only little and I have yet to notice a bad panel line detail. Which is really disconcerting. Some of the gates in the plastic plates were found to be ugly and mishapen. One area that the bootleg hugely fails at is in the quality of the marking sticker. They definitely haven't caught up in this department yet. 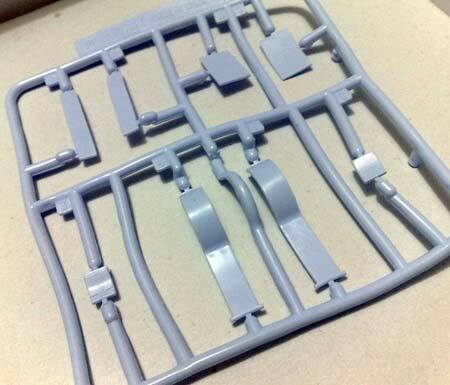 Rubber parts in the kit are also easily copied by the bootleggers. 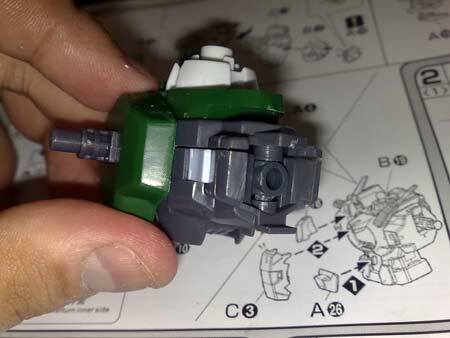 I started assembling the kit last night to see what it was like in terms of assembly quality. And yep, they were indeed right that the parts were ill fitting. 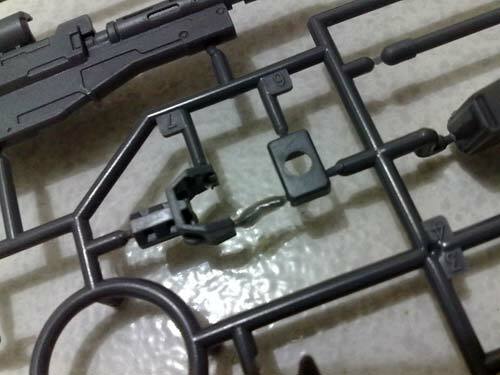 You can see huge gaps in the torso part below because the male peg did not fit in correctly with its female counterpart even after I had already filed the male peg so that it could fit. Some parts also didn't want to "snap" securely into its intended housing so I had to use some glue on it. If I bought a legitimate GN-002 it would probably cost me around 4000 yen with the shipping included. That's a 75% increase from the price of a bootleg Dynames. But what I would be sure in getting is a good quality product and the peace of mind that as a fan I had helped support the Gundam franchise. Some things that Bandai can do however to combat this can be done not only legally but in their manufacturing side as well. On the manufacturing side they can try to design kits to make it less prone to copying. Then there is also the method of battling the bootleggers in the price department. If they can lower their price a bit, near the price that the bootleg is being sold, then fans would logically flock to the original. 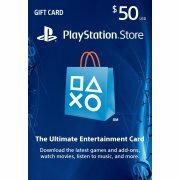 Another way to beat them while increasing their bottom line is to aggressively expand internationally. 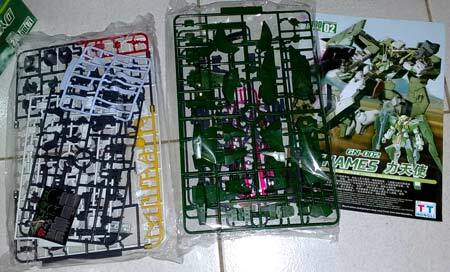 There is a lot of money to be made in exporting Gundam plastic models, hence one of the reasons why bootleggers are into this business. 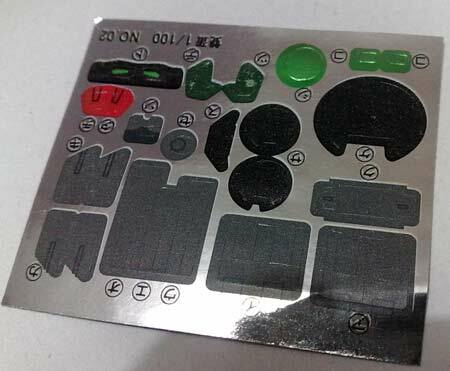 If Bandai can also try to modify their kits to suit the international market, like having an English manual, I can't see how they can't increase their income with this.